The common name of this pretty little annual or biennial flower comes from the town of Deptford in England where the plant grew abundantly. Deptford has long since been incorporated into larger London, and any pasture or woodland has been paved over or covered in concrete. This plant is native to most of Europe and can now be found in North America. 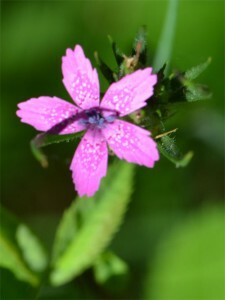 It is often cultivated because of its nice pink flowers. I found a few of these plants in the Brewster Natural History Museum, near the marsh.